Although I work as a labor and delivery nurse, my job is part-time and recently became extremely part time. Luckily, I have a lot of irons in the fire. I blog, I clean my mother’s guest cottages between tenants and I resell thrift shop finds. None of these side gigs alone are enough to make a huge difference in my income, but together they pack a wallop. A reader recently referred to this many-irons-in-the-fire income stream as a “Patchwork Income,” which I absolutely loved. No single piece of fabric in a quilt makes a difference, but together, they create warmth, beauty and a functional piece of art. Money is the same way. A few dollars here and a few dollars there and before you know it, you somehow have enough money. I wrote my blog, which earns me approximately $350 per month. I cleaned one of my mother’s guest cottages, and fished a dollar in coins from the inside of the washing machine. I cut dozens of stems from our hedgerow of hydrangeas in the backyard. The last two Portland mornings have seen frost, and I know that the first truly hard frost will turn our lovely blooms into slime. 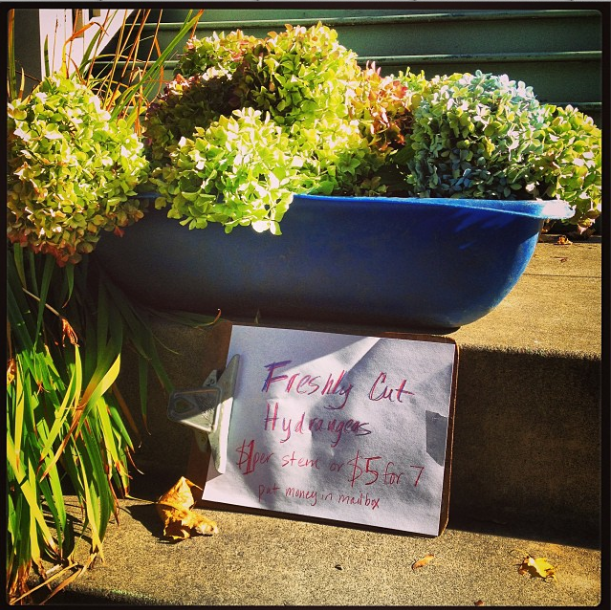 I placed the flowers in front of the house with a sign reading “Freshly cut hydrangeas — $1 per stem or $5 for 7. Put money in the mailbox.” (Which is locked.) I only sold a single flower, so the sign now says to “Pay what you will.” Not sure if this will pan out, but I just hate to waste the flowers, and they’re so beautiful right now. Serving a dinner of homemade kale pesto over dried tortellini with a chopped piece of leftover chicken. Mixing up oatmeal cookie dough for lunches. Cleaning out the refrigerator to be fully aware of the contents, which helps to minimize food waste. Hanging laundry on the clothesline. Today I work my regular job, which makes up the largest part of my patchwork income. Not enough, but with all the other pieces, it adds up. Warm and snuggly, under my patchwork income. Do you or your family members have a patchwork income? Please share your ideas and stories in the comments section below. My husband and I painted the trim on my mom’s house for a little cash. Also he’ll help rebuild a rancher’s fence (destroyed by a wildfire this year) in exchange for beef. For a good many years, I’ve kept informal records on what I call our “underground economy” (the parts of the patchwork income that haven’t come from DH’s and my day jobs). This includes the profits from our occasional garage sales; the $300 or so I make per year from picking up discarded bottles/cans on roadsides and returning them for the NY State 5-cent deposit; and all things cleaned out of the rental properties DH co-owns (he’s down to 5 properties, but at one time it was 23) and other “found objects.” Figuring out what the grand total of all this might be would require estimating the value of all the found objects, but the underground economy and other nonconsumer habits do a good deal to help us live a comfortable life. And I join you in admiring the phrase “patchwork income”! I absolutely love this topic! I am fortunate that my husband does have a steady, full-time job – and I am aware that it is this privilege that allows me to be a “Renaissance Woman.” Right now, in addition to raising our 4 kids, I run a “before school” daycare at our house in the mornings (I am up anyway, so what’s a few more kids waiting for the bus?). I tutor kids for the SAT and ACT exams (that is my most lucrative gig, by far, but it is somewhat unpredictable, and I can only do so many hours after school). I sometimes work at a local children’s bookstore (not at all lucrative – but social and lively!) I also raise chickens and goats in our 2 acre backyard – not a source of income (yet), but I am trying to figure out a way we can produce a fair portion of our dairy needs – maybe with an eye to bartering for other items down the line. I always thought I would have a “Career,” (capital “C”) – but now I shudder at the thought of being tied to one place, all day, every day. I am thinking about going back to school (part time, of course) to become a Certified Financial Planner – I just love the idea of helping other people think out of the box when it comes to budgeting and income. I love your before school daycare to watch other’s children when they have to be at work. Do you have to feed them breakfast or do they just hang out for a while? Do you walk them to the bus stop? Before-School has worked out very well for us! Kids get dropped off at our house anytime after 7:30, and the bus comes at 8:45 (the bus stop is outside our house, but I could just as easily walk them). They finish up homework, read, draw, play with our goats, dogs and chickens, and run around like crazy (outside!) I only feed them “special breakfast” on Fridays (mostly I whip up a batch of muffins, with Costco hot chocolate) – and we often have “dance parties” on Fridays as well – it’s a day we all look forward to! I’ve experimented with different price points, but what works best for us seems to be a flat fee of $10 per child per day (we are in suburban NYC, where that is considered a bargain – but obviously it could vary). I have checked with the State, and since no child is here for more than 2 hrs, we do not count as daycare, and so there is absolutely no licensing required. My youngest will “age out” next year when she goes off to middle school (sob! ), but I will keep the morning program going – – – if you like hanging out with young kids, it is a very pleasant way to start the day. I have 3 main sources of income: Office manager at a nonprofit (24 hours per week,) demo Jeni’s Splendid Ice Creams (minimum 18 hours per month,) and TaskRabbit. I have a fairly set schedule with my office manager position and spend my days off cramming gigs or tasks into them. I’ve also been selling lightly worn clothes on eBay! That’s exactly what kind of thing I would like to do. I still have all 6 of our kids at home and am homeschooling some of them. I babysit from time to time, sell on eBay and Craigslist and would love to get some revenue from blogging. You and The Frugal Girl are nice inspirations. Love the idea of patchwork income! I rent our house out on the weekends on airbnb. I help my husband run our graphic design business. Next year I’m going back to grad school, which will come with a stipend. And don’t forget interest, growth and dividends on savings and investments. I don’t spend this cash, but it is technically extra money that gets saved. I love your attitude and creativity. Thank you for sharing them with us. I’m extremely fortunate that we get by on my husband’s income. I have been pet-sitting what seems like forever. I tend to charge lower than average, but it’s usually because my friends are my clients. I also just started doing de-cluttering/organizing, which I love because I sometimes get to come home with other people’s cast offs! For me, I enjoy this type of work since I would like to not be locked in to any certain job and can take off whenever I need/want to be with my boys. It’s good to be tenacious and not panic when your regular work becomes scarce. I’m a freelance writer and know the feeling well of wondering when I will work again. I hope your work hours pick up soon. You sound like you are a great nurse. No patchwork here – regular paycheck. Large patchwork of ways to save money, though. Stocking up on food has worked really well recently. My recent best was 6 months of oatmeal for $7.50 (42 oz canisters on sale for $2.50 each, plus a $5/5 coupon). Baking materials – flour, sugar, choc, molasses, etc. – are about to hit annual low prices and coupons usually abound. You might like buying oats in bulk. I can get a 25 pound bag for $15.35. One place had a sale on them last year for $9.50 for 25 pounds! My family goes through 75 pounds a year, and it is our least expensive meal, costing me .22 total in the morning for 8 people! I love the patchwork income idea! Over the last few years I’ve done stonework for a living as well as gardening and organic vegetable farming, I play in a band and also do some painting/refinishing type work and carpentry, sometimes I knit and crochet and sell my creations. Even though I never have the time to do all these things at once I love the way that mixing and matching the income stream gives me WAY more freedom and resiliency than if I had to commit to just doing one of these things. I also love the way that rockwork/stone masonry and gardening (high paying) have subsidized farming music and crafts and allowed me to get to the point with all three of these things where I know how to make them pay off financially. I love my jobs! I love this article! Frankly, I think “patchwork income” is the way of the future. We can no longer depend on getting a job at 22 and keeping it until we get the gold watch and the cake. Instead, most of us will experience exactly what you’ve detailed — hours wax and wane, opportunities come and go, life demands change. Being able to do more than one thing means financial security. As for me, DH and I have two small businesses that are our primary incomes (respectively, industrial controls engineering/consulting and writing/higher education consulting). Then, we have two Etsy stores in completely different vertical areas (Carrot Creations — sustainable living goods, and Cucumber Key — photography). And we also garden like mad. In the meantime, we have no problem supplementing the income with odd jobs — I think DH has a small residential wiring project coming up. It all makes for a complete income when taken together. What a great topic–love the creativity you shared, Katy, and all your readers, too. For a while I had a little shop on my 3-season porch, where I sold all kinds of cute vintage finds. I miss that though it wasn’t incredibly lucrative. Now that I’m self-employed, time for “extra” projects is significantly less. But I’m looking forward to exploring some new ideas next year when our son is in school all day. For now I’m working on my next novel and grateful that I have the chance to have a job where I’m not chained to an office desk 40+ hours a week! Yes….I was forced to retire on only 2/3’s of my expected monthly benefit and so I make up the rest by odd jobs…tutoring, focus groups and mock juries, research studies at UT ( just did a journal study for 10 days online and made $50.00), making items for a local shop, and making and selling my baby quilts online. I prefer these little jobs to a steady one at my age. I want to enjoy everything each day has to offer and can do that best by not having a regular job each day. I too am living on a patchwork income. I work 25 hours a week at my county library, I am a disabled veteran and receive a small stipend from the VA, I sell my too big clothing on E-Bay, and I sell larger things I no longer need on Craigslist. I am also a very experienced seamstress, for 52 years now, so I am going to advertise mending, hemming, etc. and see if that pans out. As long as I can pay my bills, I am OK. I don’t eat much, and I get free books at work, (wahoo! ), our library even has e-books now, which is excellent. I walk to my thrift shops instead of driving, which saves gas and keeps me trim. It’s all good. I love this topic. We call it a “basket approach,” meaning, you use a variety of strategies, with the hope that when one thing goes down, another goes up, and overall you stay even. At the moment, my sources of income are part-time home-based medical transcription, about $4K/year (I’m lucky to get that much, now that everything is electronic medical records). I sell hand-knit socks on etsy, and I design knitting patterns, both of those add up to a few hundred $ per year (and I get free yarn with the pattern design). I know a woman in my community who used to sew girl scout patches on vests and charged $1 each. Easy for someone with a sewing machine! I used to do mystery shopping for a few hundred $ in a year. Of course, I count many of my frugal tricks as “income,” or money not spent. As a fellow medical transcriptionist (22 years) I feel your pain. This was a very lucrative business when I started but last year I made $7k, basically part-time. Fortunately I am very frugal but it has been difficult. I also was just awarded a new contract with a group of docs so there should be more work. I need to figure out what else to do to generate more income. I’ll work on that as well. Really like this article – but LOVE the “freshly” cut flowers!! I’m so tired of never seeing adverbs anymore! I love your hydrangeas Katy! I’d buy a $7 bunch in a heartbeat, but alas I am in Sydney. I am fortunate to have a full time job that keeps me more than busy, but I do sell on eBay from time to time. But one never knows what the future will bring, so I find all the patchworker suggestions very interesting. Trent at the Simple Dollar calls this “multiple streams of income” but I much prefer the “patchwork” term. Seems I’ve always done this. Right now I do 20 hours/week high-tech pediatric home care with my own child care health consulting business on the side, as well as being a certified childbirth educator. Did all this to piece together a part-time income when I couldn’t find one. As everyone here in the comments says, if one job wanes, other ones are waxing so it all works out. I would buy all those hydrangeas at the original price because I feel rich after selling two boxes of books my kids grew out of at Half Price Books, a large box of clothes at the fab kids resale store in my town (where I shop for my younger son, too), eating the last of the produce for free from our garden (green tomato and lentil soup! ), and making two halloween costumes (mostly from stuff we had, plus a little new yardage). Thanks for sharing your stories! I work part time. My patchwork income is not from cash: we converted our entire backyard into a vegetable garden. Most of the gifts I give come from the garden, I trade vegetables for moose from two hunter friends, I trade vegetables for handmade cards that a co-worker makes and usually sells for about $3 a card at craft shows, and I can and dehydrate so many vegetables that we buy only fruits and mushrooms. I am in charge of tending the garden, although the husband does the heavy lifting, like turning compost. We figure it adds about $5,000 in food and trade, plus I don’t have to join a gym! The one donation thing I do with the garden is grow lots and lots of pumpkins and bring them to the food bank, along with a card on each stem that tells how to process it and gives a recipe for the pulp and the seeds. Even if people don’t eat them, I like to think they give pleasure as a Halloween decoration. What a wonderful idea, with the pumpkins. Many people need ideas on how to cook “real” food, and you’ve given them knowledge! Why not grow fruit, too? I have a .24 acre lot and have grapes, blackberries, and all sorts of fruits: apples, apricots, pomegranates, lemons, plums, pears, Asian pears, and peaches. Fruit would be great for trading, plus you can make jams and jellies for gifts as well. The grapes grow on a wall, and most of the apples are espaliered on the opposite wall; blackberries grow on that wall as well. I recently added more fruit trees to my front yard; we tore out the one tree that was there and added 6 semi-dwarf fruit trees, plus places to grow lettuce and herbs. It’s a formal garden with a lot of flowers as well (which makes it less obvious to the neighbors that I’m growing food there) and the flowers the garden provides help me to have fresh flowers on my table all the time–something I could not afford to do otherwise. I recommend everyone take a look at the Prudent Homemaker website to see how lovely her front yard turned out. Hard to believe it’s in the desert. 1) Picking stuff off the curb that my neighbors throw out. I either use this stuff (toys! baby clothes! a bouncer!) or put it on Craigslist. Once a month, I open up our garage and have a garage sale with all the stuff. Last month I made $253. Not bad for stuff that was free! 2) Shopping with coupons. This isn’t so much a way to supplement our income as it is to reduce our food budget, but I save about $10-$20 per trip, so I count it. We don’t stockpile (well, I do stockpile laundry detergent because we cloth diaper and burn through it super fast), and I only use coupons on foods I buy anyways. 3) Odd jobs. On base, a lot of people will ask to borrow a truck to move furniture. They’re always willing to pay for it, so we loan ours out (along with my husband to drive it). I’ve also cooked for a pregnant woman on bedrest, cleaned for a friend, and cut someone’s lawn. 4) Tutoring. I got really good grades in high school, and have maintained them in college. I help the local high school kids out for $5 an hour, making me the cheapest tutor in the area. As a result, I have a lot more business! We also practice frugality in the form of un-paper towels and napkins, using some of the stuff we find on the curb (I’ve never bought my son a toy) (I take that back, I bought a secondhand Sophie le Giraffe on eBay), cloth diapering, using cloth pads, and eating soup three times a week (soup is cheap). That tutoring fee is really generous. My sister-in-law charges $25 to $35 per hour and people seem happy to pay it. We are in Southern California. Oh, yes! I sell stuff online, get money for advertising on my YouTube videos and a little from my pathetically neglected blog, earn interest from a land contract we bought from my aunt and uncle, run an occasional estate sale, get dividends from our mutual funds, and once an a while perform as a musician. I LOVE not having a “real” job! I am also living a Patchwork income life. Thankfully my husband has a full-time job, but I do what I can to make some extra money and be available for our 3 kids. I work 10-15 hours a week stocking greeting cards in a local grocery store chain, work 1 day a week at a wine tasting (free wine! ), substitute teach when I can, and sell a few items on ebay. It all adds up to a good bit of money, and my schedule is flexible, which is most important for our family. I may not be using my almost finished doctorate in music, but this is what works for us right now. 1. Patchwork Money: Been helping someone with year end closings and have so far earned $190 — super boring but it added up! 3. Last week I got a great opportunity for some “real work ” that I’m doing today. 4. A friend is referring me for an administrative job that may be open soon. It is not what I usually do, but I am trying to reconcile that with the fact that since I am older, I just don’t fit in with the tech crowd anymore so it’s not likely they will hire me, and I really need a regular gig! Maybe it is time to slow down?? 5. I was emailed a Petco coupon for a free 4.5 lb bag of any pet food. It came up just as I ran out of dog food… what great timing! 6. Shopped Grocery outlet today — they have many coupons and great deals… I have to restrain myself so I don’t overbuy. 7. Before that I treated myself to frozen yogurt and with my birthday coupon it was only $1.31. There are quite a few more birthday offers coming — yay for Birthdays! Birthday freebies is how I treat myself at my birthday (yes, I am on a limited income). When I do have money I try to pay it forward by frequenting the businesses who have been generous. Here’a link to birthday freebies: https://www.thepennyhoarder.com/deals/100-places-will-give-free-stuff-birthday/ So my horoscope was right last week when it said that I “will be entering a period of great luck”. It actually said a 7-year period… so far, so good! Fellow Patchwork income earner here. The bulk of my income is as a resource teacher doing portfolio reviews for homeschoolers, but it’s seasonal – mostly in the summer. I also teach classes to homeschoolers. As a Notary Public in Maine, I can perform wedding ceremonies and Notarize documents. I can charge a “reasonable” fee for those services. I am a blogger and earn a small income from partner links (mostly Amazon), and I am a freelance writer with some income coming from paid articles. I also do some small jobs, like walking dogs. I don’t earn a lot, but I do save a lot by being able to do things, like volunteer at the theater for free tickets, cook most of our food from whole ingredients, line dry our clothes, heat with wood, etc. Most of my actual “earnings” is in money we save by having me DIY a lot of stuff around the house. Great post! While I do have a full-time job I also recently opened up an Etsy shop to start working on selling some homemade crafts. I’m also selling vintage and upcycle things and I’m hoping that I would be able to do that eventually full time. What a nice surprise to find this great article and all of the comments. 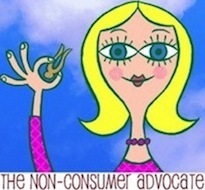 I follow your Non-Consumer Advocate blog each week and thought that this was a new post. As I began reading the comments I noticed that most were dated from 2013. How this older post came up on Facebook I don’t know, but I am grateful. It has been a good read.